Let’s face it – unless you’re an independently-wealthy yoga instructor, you’re probably a little more than a little stressed out most of the time. Stress is almost always listed as one of the main reasons people feel sick and tired and it’s been estimated that 70-80% of primary care visits to the doctor are, at least in part, due to stress. So the question isn’t whether we are stressed or not – we are. Our bodies were designed to deal with stress. From the beginning of time, the world has (literally) been out to get us in some shape or form. The difference in today’s world is that most of our stress is self-inflicted. We bombard ourselves with information – news feeds, posts, tweets, podcasts, shows, programs – most of which cause us to get upset, angry, fearful or feel anything-but safe and grounded. Add to this our (normally sub-optimal) food choices, an alcoholic drink here and there and some run-of the mill pollution and you’ve just found yourself in a state of constant stress called your life. In years gone by, there was an ebb-and-flow to stress – stressful events came, they were dealt with, and things returned to ‘normal’. The issue now is that our state of ‘normal’ is full of stress and that for most of us, this is more than our body can handle. The stress response has been studied for decades; what is now known is that even though we all experience stress, each one of us adapts to and/or respond to it differently. AND, how we respond to stress makes all the difference in the world. It’s not the stressors in life that make us sick; it’s how we respond to them that does. So, the optimal way to help improve our reaction to stress is to (a) find out how we respond to stress and (b) improve our ability to handle stress by providing our bodies the proper support. Many people when they are faced with stressors feel very tired. Often times, these people have been under stress for a long time and/or have recently had a major stressful event occur (loss of a job/loved one, marriage/divorce, accident, etc.). Common symptoms include: feeling weak and tired, looking pale or feeling ‘puffy’, waking up feeling unrefreshed, apathy, decreased (NO) libido, poor muscle tone or the inability to gain muscle, depression and/or unexplained weight gain. These people may very well present with multiple organ issues (i..e, blood sugar problems, menstrual issues, hot flashes, thyroid issues, prostate disorders) in addition to fatigue. Most of the time, they need targeted support to enhance energy and stamina and improve their resistance to stress in order to start the healing process. 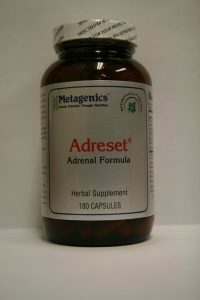 Adreset contains three of the most powerful botanicals known to help those that are stressed and tired. It contains standardized extracts of cordyceps, Panax ginseng and Rhodiola and is specially designed to build resilience and enhance stamina in people that are feeling weak and fatigued due to stress. We have used this formula with people across the globe and there are hundreds of studies on these herbs to support their use. Using Adreset along with traditional stress management therapies, including deep breathing, meditation and mild-to-moderate exercise can establish the foundation on which a complete program can be built to restore optimal health.